Come and join us for our 80's - 90's Disco Party at 360 Beyoglu. You are invited to our "Weekend Dance Party" on Saturday, 13 April. The DJ will perform great music from the best disco music decades- so be ready to dance the night away. 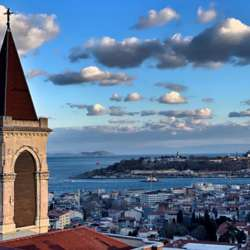 The club has a breathtaking landscape view of Istanbul all the way from the up close steeple of St Antoine’s Church and across the Bosphorus to the Hagia Sophia Mosque and out to the Sea of Marmara. ** This venue has a strict dress code: smart casual **The entrance fee is cash only - we do not have credit card facilities. We will be at the InterNation’s Welcome Desk until latest 22.30, after this time the management of Club 360 will take over. After 22.30 it is at the discretion of the Club who they allow to enter and there will be an admission fee of 60 TL. Pls come before 22.15 to avoid any inconvenience. You are welcome to bring your expatriate friends!